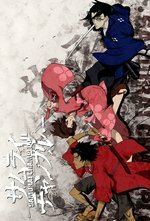 Mugen, Jin, and Fuu reunite, as the struggle between the Nagatomi Gang and the established Kawara Gang grows more intense, due to actions by Sousuke Kawara. The leaders of the gangs decide to gamble using dice (Chō-Han) in order to settle the struggle and settle the fate of their struggle to control the contested territory. Who will come out on top? Links for viewing: login-reqested and age-restricted, subbed and dubbed in English on YouTube; age-restricted, subbed and dubbed in English on Hulu; fansubbed and heavily vignetted dub [hd], without restrictions on YouTube. Guide to anachronisms for this episode, on Yakuza boss Rikiei's shades (again), the metal nail file, and a short history on dice. This pair of episodes seem to come straight from a Zatoichi movie. Rival yakuza gangs, a woman forced into prostitution because of a relative, gambling and dice tricks, the outsider perspective--all remind me of a story of the blind swordsman. Good call on the Zatoichi reference/homage. For anyone who wants more context, here are notes from a fansubber on this episode.